Product prices and availability are accurate as of 2019-04-23 00:09:16 BST and are subject to change. Any price and availability information displayed on http://www.amazon.co.uk/ at the time of purchase will apply to the purchase of this product. 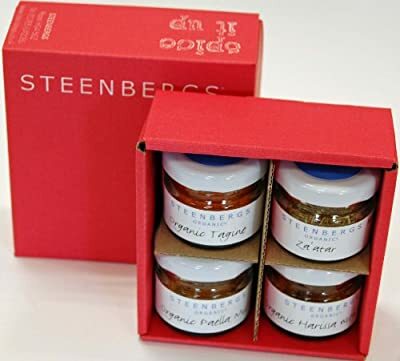 Steenbergs taster box contains four of our most popular spice blends - Za'atar, organic paella, organic harissa with rose and organic tagine blend. A great present and introduction to some of Steenbergs delicious blends. As with all Steenbergs blends, these are created by Steenbergs chief blender, overseen by Axel - the creater and recipe developer, and packed at the Steenbergs spice factory in rural North Yorkshire, just north of the cathedral city of Ripon. Steenbergs was set up in 2003 by husband and wife team - Sophie and Axel - as an artisan spice company who offer a wide range of tasty organic and ethical spice blends and specialists spices from around the world. Enjoy! These are all packed up in our new red mini cardboard box.